Lets start off by getting some data. For this tutorial we will gather data from World Bank found here. To make this process less about acquiring data and more about calculating the CAGR. Below is the Query Editor code you can copy and paste directly into the Advance Editor. Note: The tutorial on how to copy and paste the code into the Query Editor is located here. Paste the code above into the advance editor. Click Done to load the query into the the Query Editor. 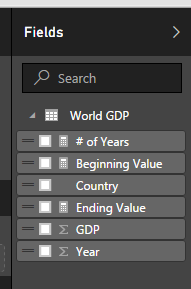 Rename the Query to World GDP and then on the home ribbon click Close & Apply. 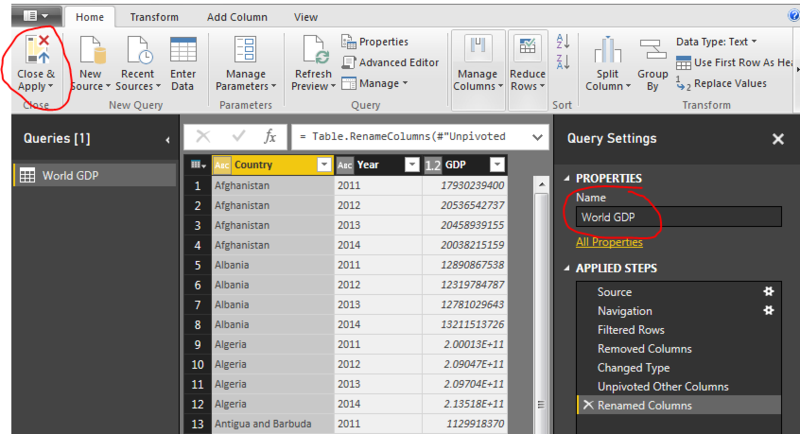 Loading the query loads the following columns into the fields bar on the right hand side of the screen. This equation totals all the items in the table called World GDP in the column labeled GDP. This calculation will change based on the selections in the page view. Next add a Card visual for each new measure we added. A measure is illustrated by the little calculator image next to the measure. I have highlighted the Ending Value measure as a card for an example. This calculation uses the prior three measures we created. 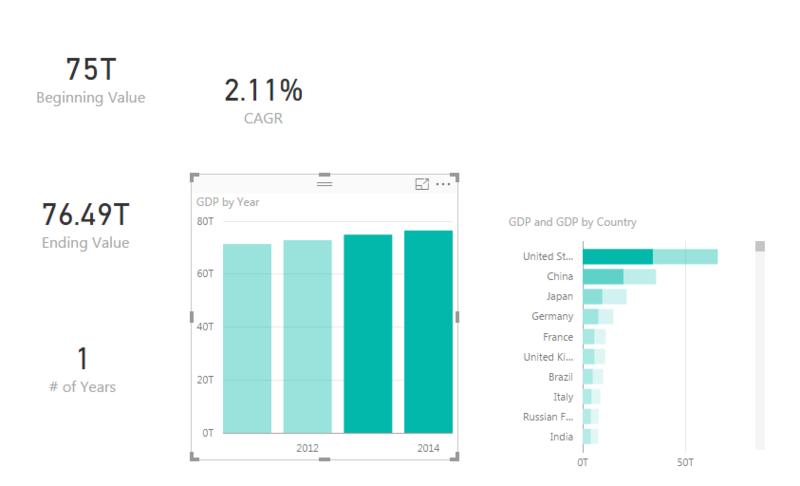 Add the CAGR as a card visual to the page. Notice how the value of this measure is listed as a decimal, which isn’t very useful. 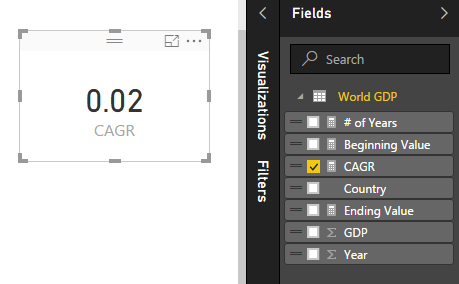 To change this to a percentage click on the measure CAGR item in the Fields list. Then on the Modeling ribbon change the format from General to Percentage. This changes the card visual to now be in a percentage format. Now you can add some fun visuals to the page and depending on what is selected the CAGR will change depending on the selected values. A final recommendation is to wrap the CAGR calculation in an IFERROR function to make sure if one year is selected the measure doesn’t fail. This returns a 0 if there is a calculation error of the equation. Documentation on IFERROR is found here. 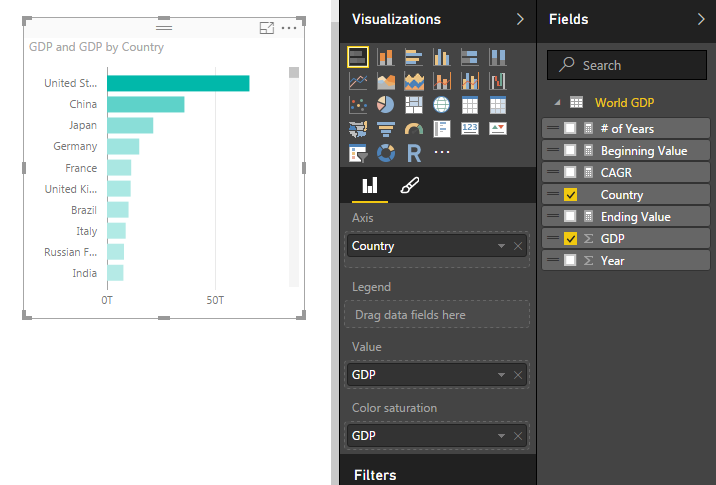 Note: you can sort the items in the stacked bar chart by selecting the ellipsis (the three dots in the upper right hand corner) and then selecting Sort By and clicking GDP. 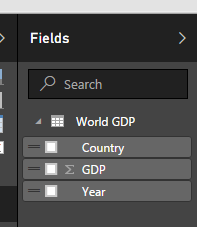 Finally select different items in the GDP by Year chart or the GDP by Country chart. To select more than one item in the bar charts you have hold shift and left mouse click the multiple items. Notice how all the measures change. 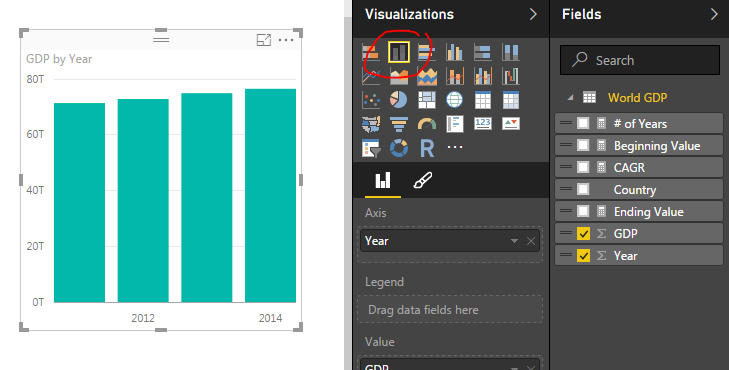 Power BI Desktop (I’m using the April 2016 version, 2.34.4372.322) download the latest version from Microsoft Here. I would like a line graph that shows the percentage change of the COUNT of employee ID’s in a column over a span of 16 quarters. I’m wondering if you could provide some assistance? Ok, I have done some research on what you were asking. Maybe this will help. Thus, the count for Badge 123 would be in total 4, it appeared every in every date. For badge 456 the count would be 2. When you mention % change it gets much more difficult. Now you have to determine how the percent change will operate. For our example you have a date range of 4 days. 1/1 to 1/4 for percent change you want to calculate the total of the first 2 days then compare compare to the second two. This is when the measure come in handy. To do this I calculate everything off the Max date. – you do this because there will be time periods when there are an odd number of days, for example if your time period was 35 you would have to calculate your percent change between 17.5 days, this doesn’t make sense. Thus you round down, so when the time period is an odd number half the time period is a whole number. This makes 35 rounded down to 17 days. I am new to this blog. my apologies, if I am too direct. I have a problem for which I am unable to find a solution. I was wondering if you could give some solution, would be really appreciative. I am working in excel powerpivot, have slight knowledge of DAX. I have a table in which I have userIDs, and their level play details. The details include level no, start time and end time of each level. I want to calculate the session count and approx duration for each session. The sessions will be ofcourse for each individual user ID. A Session will/can include multiple levels, I am taking all levels that start within 5 minutes of completion of previous level as one sesssion. Waiting for any and all guidance. This is a really tricky one. 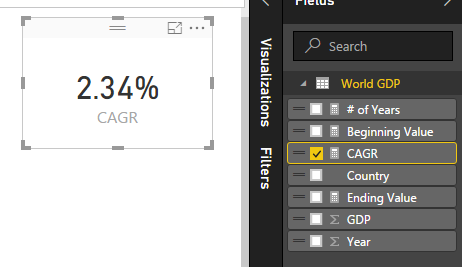 I think within PowerBI or Excel you could calculate the duration of each level. However, when you want to string together a number of user sessions and designate a time window of 5 minutes between each session your working with an indefinite amount. For example user 123 could have played level 1 (4min), 2 (3min), and 3 (5 min), for a total time of 15 minutes. From what i read above this would be a session. However, because of the way your data is structured you have to compare every end time to start time where the user id is the same. This now becomes more of a question that would have to be solved inside a database. I am not a aware of any methods that exist today that would let you build a session for a user. If I were going to build I would have to run the data through some sort of SQL data warehouse to aggregate the session info. Sorry that probably wasn’t to helpful. Good luck on your game. Expression.Error: The column ” of the table wasn’t found. I am unable to get the data for the exercise but did manage to download the .csv file and after some removing of columns, transposing and fill-ing of data I have a file with a row for each country and a column for each year. 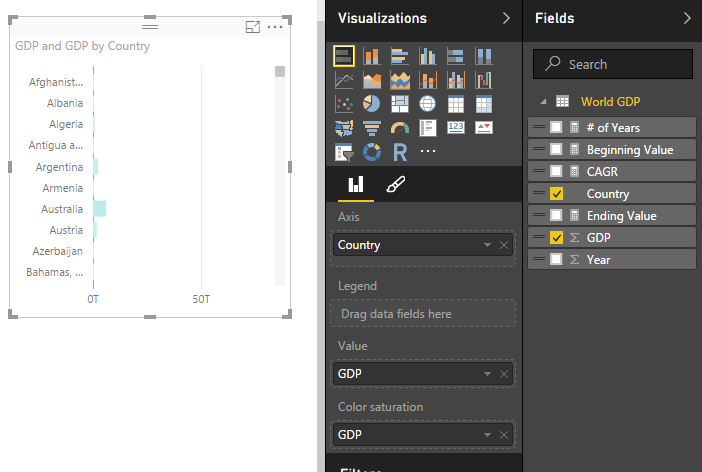 Is there a way in PowerBI to get this in the Year, Country GDP format you use for the exercise? This should allow you to complete the tutorial.